I've made a playlist of the 1st song of the 100 most recently released albums on Magnatune. This makes it easy to listen to what's new, since you can quickly scan a bunch of music to see what you like. Note that put the GENRE: a the beginning of each track name, so you can skip the types of music you don't like. This week, I'm also going to try including this "new releases" player in the new-releases announcement email, so people can listen to the new releases inside their email program. We'll see if people like that or find it annoying. The video game Braid came out today for the Xbox Live Arcade to rapturous reviews, such as this one from PC Gamer Magazine (UK): "Braid is an ingenious and startlingly creative puzzle game, built with an understanding of good game design that even some of the industry's most revered figures could learn from." The music in the game is licensed from Magnatune and the Braid Blog lists all the sources. * “Maenam”, by Jami Sieber, from the album Hidden Sky. * “Undercurrent” and “The Darkening Ground”, by Jami Sieber, from the album Lush Mechanique. * “Tell It By Heart” and “Long Past Gone”, by Jami Sieber, from the album Second Sight. * “Downstream”, by Shira Kammen, from the album Music of Waters. * “Lullaby Set”, by Shira Kammen and Swan, from the album Wild Wood. * “Romanesca”, by Cheryl Ann Fulton, from the album The Once and Future Harp. Here is a youtube video showing the game play, as well as the use of the music. 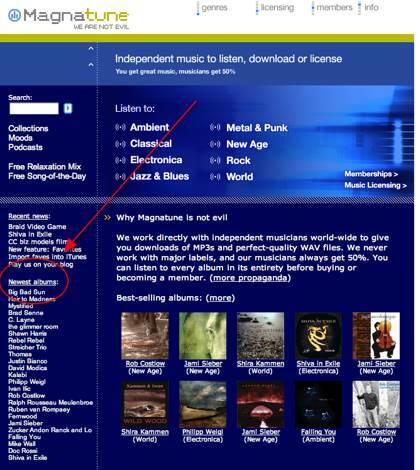 A big hearty thanks to Braid for blogging and promoting their use of our music!